Welcome back for Week 5 of our 2013 Season. As I told you earlier, I have created this blog to communicate with you more directly and to eliminate email attachments. You may visit it at any time, but particularly after midnight on Thursdays to see the weekly notes and the site plan. Another 2013 innovation, each week we’ll host just one crafter or local artist selling self-produced work. The program is organized by Market favorite Aimee Eckert. This week’s Featured Artist is Sylvia Starlight Toys. Veggie Valet will be back this week in a space near the police station. David Hodges will have pre-cut tablecloth sections ($5 for a 4-foot length) to help you quickly and easily identify any produce you’ve purchased for resale. You may also request sections cut to specific lengths. 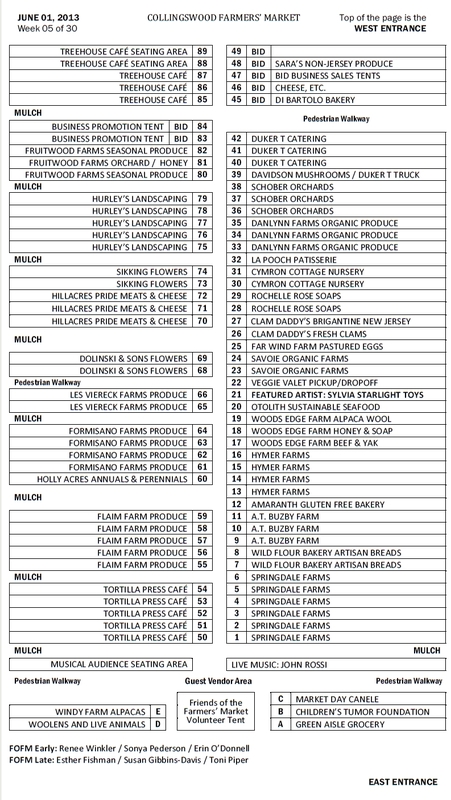 Green-and-white striped tablecloths will indicate produce you have purchased from a Jersey Fresh farm for resale. Red-and-white striped tablecloths will indicate produce not grown in New Jersey. Changes will continue to occur throughout the season as vendors come and go and as we learn more about how neighbors interact. I remind you no spaces are ever guaranteed and require your cooperation if I move your location any given week. Monroeville Winery braved the winds last week and will return this Saturday for their second market day. John & Kira’s Chocolates will return as well, for their second week. Visalli Farm will bring back with their bedding plants and hanging baskets after a week off forced by Kathy’s broken elbow. Wish them well, please. Remember, no particular space is ever guaranteed. We do our best to accommodate your space and location needs, especially if you make them known to us! We appreciate your flexibility in making the Market a big success for everyone. Doctors will hold “check-up” visits of children’s stuffed toys on Plaza. An Emergency Vehicle will be on display for tours on plaza. This Disney Program is designed to teach children NOT to be afraid of Doctors/medical professionals. Flyers promoting this event have been distributed and it has also been promoted on VTC FB/Twitter with 95 shares of the post. I’ve invited you to this special blog where I’ll be posting site plans and news of interest to vendors at the Collingswood and Voorhees Farmers’ Markets. From now on, Thursday emails will contain a link to this blog instead of attachments with site plans and Market details. The other big advantage of this technique is that you can “carry your site plan with you” on your smart phone at the Market. 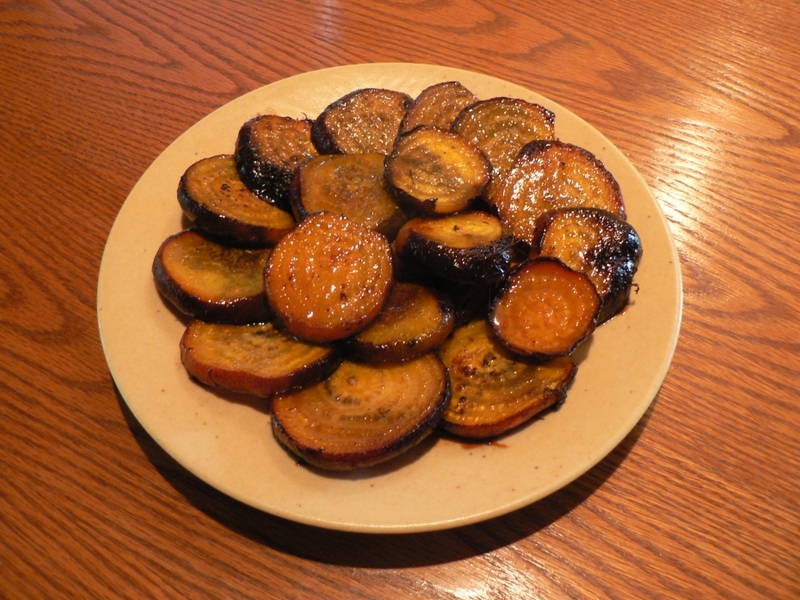 These are golden beets from Fruitwood Farm, oven roasted, sliced thick, pan crisped in olive oil, and finished with a honey glaze. Thanks to Lindsey Ferguson for the recipe. 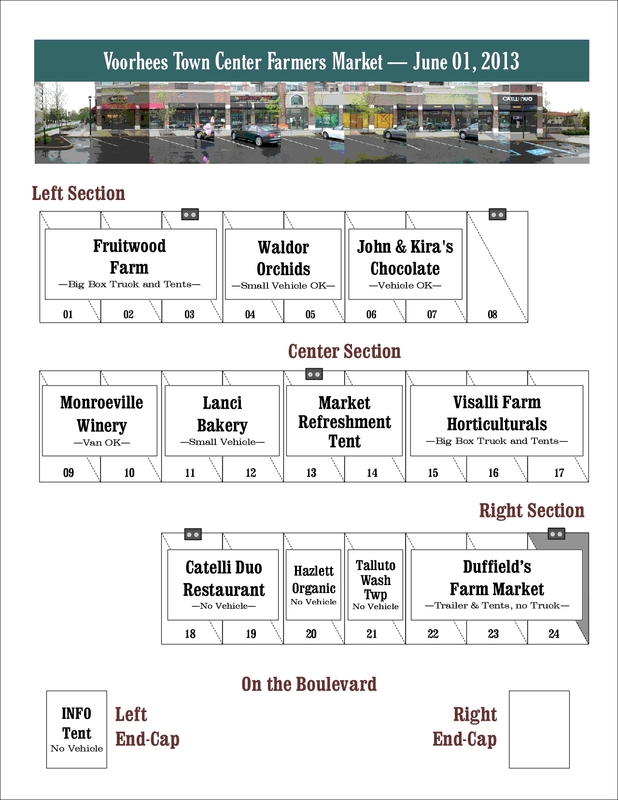 Scroll through the blog to see the site plans and vendor notes for Collingswood and Voorhees, SAT MAY 25. Then watch out for email on THU MAY 30 for a link to the site plans for SAT JUN 01. Revised Site Plan attached for SAT MAY 25. Hank’s Hot Sauce will not attend tomorrow. Sweet Pea CSA required 20 feet to make room for their truck. Those two small changes required moving some vendors. Tomorrow I’ll review your space and vehicle needs with each of you so I can make wiser placement choices whenever possible. The Thursday night email is reproduced below. We have not been particularly lucky with weather so far this season, and this Saturday may feature a brief shower too, but overall, we’ll have partly sunny skies and mild temperatures for our third week of the season. You may remember Woods Edge Wool Farm from last season. They’ll be back with us this week with woolen alpaca socks, rugs and other garments, honey from their hives, soaps, and yak—yes yak!—meat in the freezer, among other delectable edibles. Brand New this year: Monroeville Winery will attend the Market every week Bellview does not . . . so we can always tell our customers fine Jersey wine is available for purchase and sampling! Brand New this year: Sweet Pea CSA will bring pastured eggs and (eventually) fresh-slaughtered hens. This week though, they’ll have herbs and potted vegetables. David Hodges will visit the site very early Saturday morning again to mark the numbers and vendor initials of all spaces directly on the pavement in chalk. He’ll also be onsite to visit with each of you after 9am. As always, plan to arrive early to avoid trouble getting into your space and be kind to those who arrive after you’ve parked. We’ve done our best to stagger the vehicles so “in-market parking” will not be a problem. Of course, it’s possible Market management may need to make ad hoc changes to the best-laid plans. If we don’t already have your Certificate of Insurance, properly executed with the appropriate certificate holder and “other insured” list, please bring that document to the Market Saturday. Bring your fully executed contract with completed calendar of selected dates if you haven’t yet committed to specific Saturdays. David and Mike will team up to enforce paperwork and payment compliance to be fair to everyone. Email Kathi Hoelscher [HoelschK@preit.com] at the Voorhees Town Center office if you need further details. Week 4 of our 2013 is the very different Mayfair Saturday. The site plan is most unusual since we’re relocated to Irvin Avenue for just this one week each year. For most of you, this is no surprise; we’ve been through it many times before. For newcomers, the dislocation will be a bit traumatic. With very few exceptions (and you know who you are because we discussed the details on SAT MAY 18), vehicles cannot be driven or parked on Irvin Avenue this Saturday. The vast majority of you will park in the lot behind the Kitchen Associates building and unload by foot onto Irvin Avenue. If you haven’t been given a vehicle schedule, or if you don’t arrive on time, DO NOT TRY TO DRIVE ONTO IRVIN AVENUE. 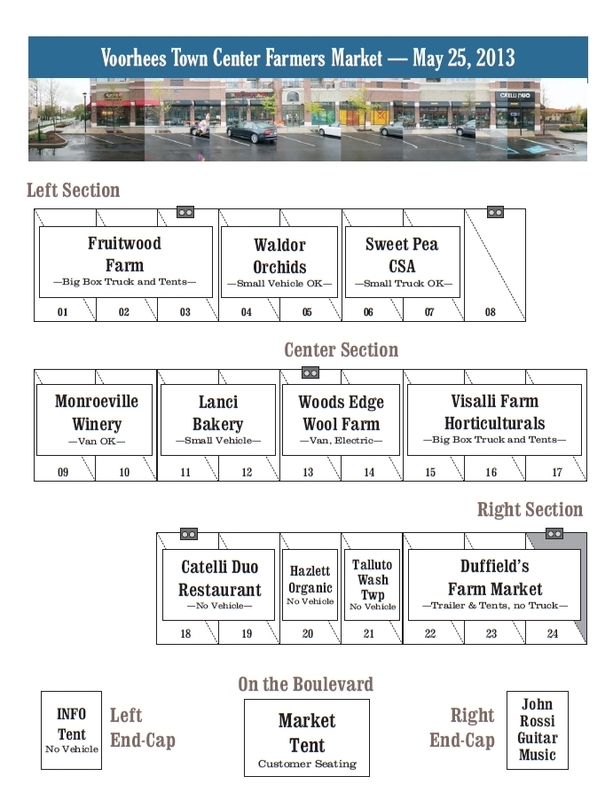 The Irvin Avenue Site Plan is attached. In addition, David will be chalking the pavement squares with your initials to confirm which spaces you’ve been assigned. Two guest vendors have elected to join us for this unusual week. John & Kira’s Chocolates. This will be the second appearance at the Market for this popular Philadelphia chocolatier. John & Kira’s cancelled. Hand and Paw Massage will be making their very first Market appearance of any season. Consider visiting with your agitated pet for a relaxing session. There will be no Veggie Valet or dedicated Nonprofits spaces this week. Both will return SAT JUN 01. This week especially I will need vendors to be flexible and understanding as you set up your spaces. There is “air” in the site plan, and spaces available to trade if for any reason the space you’ve been assigned seems inappropriate or inaccessible. I will be on the site from 6am until 8am to facilitate the load-in, after which I will depart. Remain calm and sell a lot of stuff.